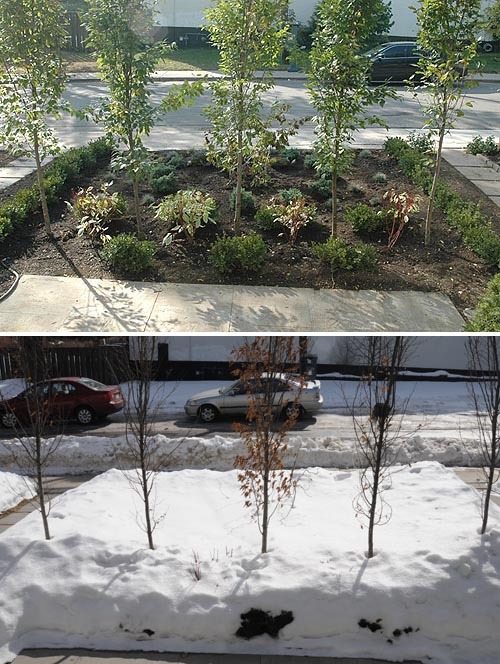 In the Spring of 2007 we decided to rip up our interlocking brick driveway which spanned the entire 34 ft of our property and replace it with a 10 ft. wide permeable driveway, and have trees and plants in the remaining area. Of course first we had to work through a maze of bylaws and get permission from the City of Toronto. You can read about our adventure in The Green Driveway Articles. 1. Spring 2007: Interlocking brick for the full 34 foot width. Photo by Michael Stuparyk, Toronto Star. 2. Fall 2007: Green driveway planted with drought-tolerant Eco-Lawn grass. Load-bearing PermaTurf underneath provides a solid base for vehicles to drive on without crushing the grass. The view from our front door is more aesthetically pleasing now. The row of Hornbeam trees gives us privacy from the street. In the future it will provide natural shade, and cooling. Many people ask us if we shovel our green driveway. Of course, grass is not the only way to go. There are other materials which will provide permeability, and allow rainwater to soak into the ground rather than being diverted into the sewers. You will need to research permeable materials that are acceptable in your area as they vary quite a bit. Our green driveway has met all of our expectations and requirements. 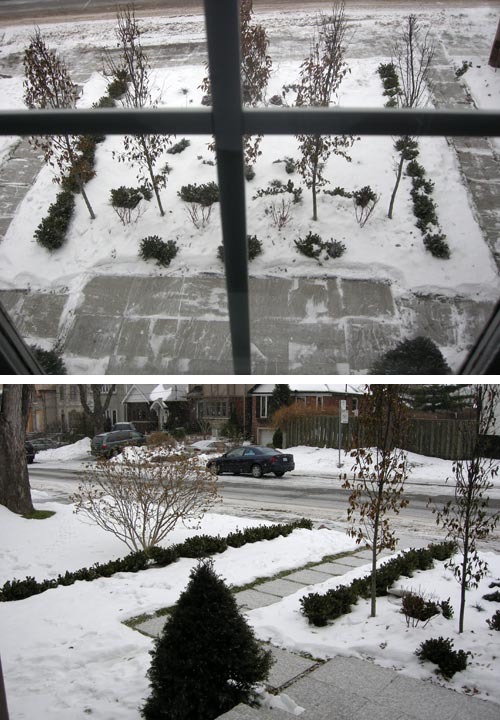 The trade-off of more exercise from walking versus shoveling is one we are very happy with. Just wondering what the watering is like in summer months ?? with the dry hot summer was there a need to water more ?? We planted Eco-lawn which is drought-tolerant grass from Wildflower Farms. It will need much less water than conventional grass as it has roots up to 13 inches long. That said, this will be the first summer of growth. We only planted it in Autumn 2007. So I would expect that everything we planted will need careful watering in the first two years of growth until the plants are well established. Hi, Franke, just checking in. The drive looks great! The bottom line is that planted driveways reduce the cost per square foot of your residential building project. The outcome is that you can spend less on the exterior of your home, and more in the interior where you actually live, or pocket the savings. I live in high desert at 5300 feet on the east side of the Sierra Nevada mountains. It is a desert and VERY dry. Sagebrush at the edge of pine forest. I’m wondering if there is a tested variant to using grass in the grid? Is there some form of gravel that would work? Does the grid work hold the gravel without requiring a concrete curb on both sides of the driveway? My driveway is about 300 feet ling and contains a small portion with a close to 15% grade. Right now, all is sand/roadbase. I’m looking for something less dusty in the summer, and better able to handle snow plowing in winter and sometimes heavy winter rains (weather has gotten weird here abouts). Thanks much for any comments/suggestions/pointers. Hi Franke… I am following your lead and will be installing a PermaTurf driveway here in Maryland. I have to jump through some City planning hoops (I go before the Planning Commission next month). I have been told they want to allow it – they should as we are a riverside community – but that they have to address existing city codes prohibiting parking on grass. – I may have missed it, but how deep is the sub-base for your installation? – And is your walkway material (flagstone?) permeable? Thanks for any help. I found all the info you’ve shared to be very helpful and inspiring. Congrats! What nice news as I’m currently finishing up my visit to COP15 at Copenhagen. Great to hear that you’re greening the way in your home town. This post is the most detailed on the “how-to’s” but for the specifics on the depth we followed the manufacturer’s instructions. So, depending on what paver you’re using the instructions will vary. As I recall we dug down about 12″. 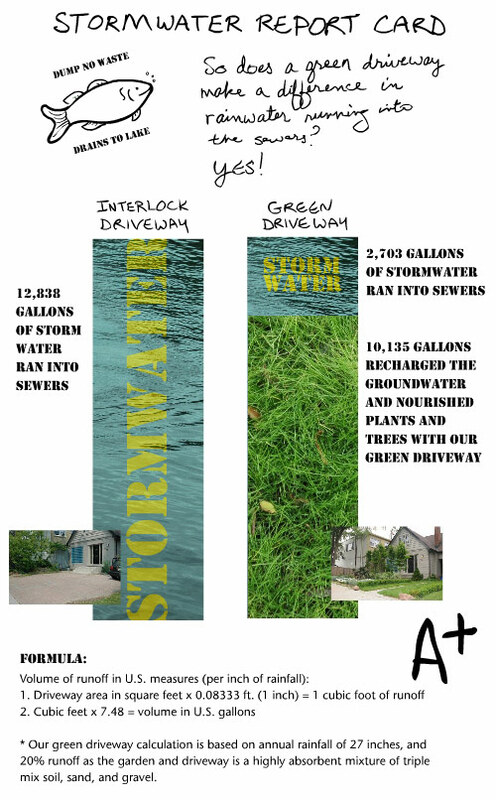 The flagstones are not permeable — but if you look at the stormwater report card I did you’ll see we’ve managed to keep about 10,000 gallons out of the sewers. Good luck! Please send me a photo when it’s done (and a before photo too! ).